Lahore: Under the direction of the Chief Minister of the Punjab, Mian Muhammad Shahbaz Sharif; Punjab Skills Development Fund (PSDF) has taken concrete steps to create employment opportunities in the Gulf for skilled workforce of Punjab. PSDF and Rotana have signed a landmark agreement to employ skilled workforce in their hotels & resorts that has been trained under the PSDF banner. L-R: Mr. Jawad Khan, CEO PSDF and Mr. Omer Kaddouri, President & CEO Rotana. With properties operational across the Middle East, Africa and Turkey, Rotana is counted amongst the leading hotel management companies, offering five and four-star products. 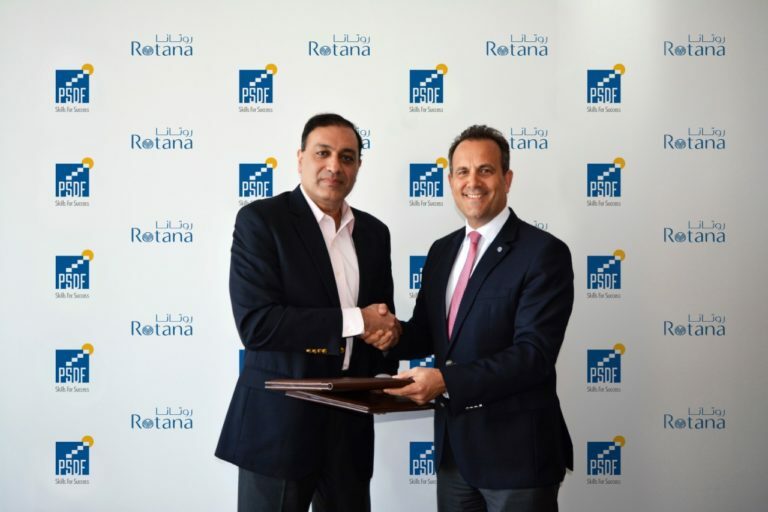 Earlier this year, PSDF inked an agreement with Rotana with an understanding to provide skilled individuals from the hospitality sector in the trades of Housekeeping, Waiters/Waitresses and Commis – Chefs at various Rotana hotels & resorts. The Memorandum of Understanding (MoU) was signed between Mr. Jawad Khan, Chief Executive Officer (CEO) PSDF and Mr. Omer Kaddouri, President & Chief Executive Officer (CEO) Rotana. By employing a rigorous selection process, PSDF shortlisted a pool of the finest candidates from various districts of Punjab. This joint collaboration between PSDF and Rotana is expected to benefit 75+ candidates in the first phase of training and employment. Commenting on this collaboration, Mr. Omer Kaddouri, President &CEO Rotana said, “With our aggressive expansion plan, we are always on the search for talent and our agreement with a highly reputable company such as PSDF will certainly assist us to attract the right calibre for our hotels & resorts”. Punjab Skills Development Fund (PSDF) is a section 42 not-for-profit company established in 2010 under the Companies Ordinance 1984 by the Government of the Punjab in partnership with the UK’s Department for International Development (DFID, UK). The World Bank is also providing funds to the Punjab Government for the trainings to be funded by PSDF. PSDF aims to provide quality skills and vocational training opportunities to the poor and vulnerable populations of all the 36 districts of Punjab in order to improve livelihood prospects for them. Since its establishment in 2011, PSDF has trained 150,000 youth in over 200 trades and it works with over 250 private and public sector training providers. Over the next 5 years, we will be training over 400,000 youth across Punjab that will be employed in Pakistan and abroad. Rotana currently manages a portfolio of over 100 properties throughout the Middle East, Africa and Turkey with an aggressive expansion plan in place. Rotana has chosen to acknowledge how precious time is by making all time spent in their range of hotels ‘Treasured Time’. This means Rotana has pledged to understand and meet the individual needs of all guests. In so doing, Rotana has evolved its product brands to include, Rotana Hotels & Resorts, Centro Hotels by Rotana, Rayhaan Hotels & Resorts by Rotana, Arjaan Hotel Apartments by Rotana and The Residences by Rotana. Treasured Time. The Rotana promise to you. Further information on any Rotana property, its brands or reservations can be obtained by visiting rotana.com or by contacting one of the regional sales offices. Address: 21-A, H Block, Dr. Mateen Fatima Road, Gulberg II, Lahore, Pakistan.